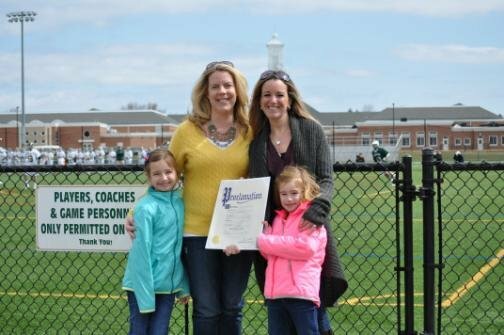 Legislator Kara Hahn presented a proclamation to Lauren, Kaitlyn and Linsey Cody in remembrance of Ward Melville High School sports star Brendan Cody. East Setauket, NY - March 7, 2014 - Former Ward Melville High School football and lacrosse player Brendan Cody was posthumously honored for his contribution to the school’s athletic programs during the Patriots’ April 5, 2014 home game. Legislator Kara Hahn was on hand to remember her former classmate who passed away last November from sinus cancer at the age of 44. Cody helped lead the Ward Melville Patriots to two state titles and earned the most valuable player award in 1988. That year he also earned Newsday's all-Long Island honors in football and all-Suffolk for lacrosse. In 2003, Cody was inducted into the Ward Melville Athletic Hall of Fame in recognition of his achievements locally, and during his time at Nassau Community College and Johns Hopkins University. Cody is survived by his wife, Lauren and daughters Kaitlyn and Linsey who were in attendance during the ceremony. Subject: LongIsland.com - Your Name sent you Article details of "Ward Melville High School Sports Legend Brendan Cody Honored"